Tarps Plus Blog: Tarp Tents are a Must Have More Than Ever! Tarp Tents are a Must Have More Than Ever! 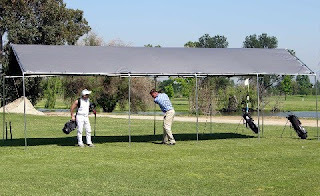 The famous Tarp Tent is here at Tarps Plus with a variety of colors, sizes and qualities. The winter and fall brings a lot of water and water can sometimes bring damage to personal belongings and this is why the Tarp Tent is such a great tent to have. The Tarp Tent will keep your cars protected or you may also use it for storage and enclose your tarp tent with tarps and ball bungees available at the Tarps Plus store. These Tarp Tents come with 8 mil-12 mil poly tarp covers and heavy duty frames which are also available in 2 inch pole diameters. The set up for these Tarp Tents are a breeze, no tools are required. Take a look at all the Tarp Tents available on http://www.tarpsplus.com/ and save with today's sales!. I am in love with my Tarp Tent, I purchased it 4 years ago and its still in great shape but I had to stop by for Foot Pads. We used a tarp tent to make a shaded play area for our kids...they love it! !